Pertussis or “whooping cough” is an acute respiratory illness that commonly affects the infants and the young children. Its first outbreaks were described in the 16th century, and the bacteria were first isolated in 1906. It is an important cause of infant mortality worldwide and continues to be a public health issue even in countries with high vaccination coverage. The World Health Organization estimates show that in 2008, about 16 million cases of pertussis occurred worldwide and 95% of which occurred in developing countries. In 2016, 37,274 cases of pertussis were reported in India. Even though the diphtheria-pertussis-tetanus (DPT) vaccine is available for the disease, occurrence of infection even after vaccination has been reported. Herein, we report a case who presented with ophthalmic complaints and based on these he was later diagnosed to be suffering from whooping cough. An 11-year-old boy was referred by his consulting pediatrician for evaluation of progressive, painless, recurrent subconjunctival hemorrhage (SCH), and upper and lower lid ecchymosis of both eyes for the past 15 days. He gave a history of coughing paroxysms associated with vomiting and mild-grade fever. There was no history of trauma, coagulopathy, blood dyscrasias, or any other systemic disease. The recommended five doses of DPT vaccine had been received as per the vaccination schedule. His last DPT vaccine was given at the age of 5 years. On examination, his visual acuity was 6/6 in both eyes. External examination showed upper and lower eyelid ecchymosis in both eyes [Figure 1]. Slit lamp examination showed SCH both eyes [Figure 2]a and [Figure 2]b. His rest of the anterior segment examination was unremarkable. The dilated fundus examination was within normal limits. He had a normal chest X-ray. Complete blood cell count revealed an elevated total white blood cell count with a normal platelet count. In consultation with the pediatrician, a probable diagnosis of pertussis was made based on the clinical history of a cough with paroxysms for more than 2 weeks and posttussive vomiting. The diagnosis was confirmed by positive nasopharyngeal swab polymerase chain reaction (PCR) test. He was successfully treated in consultation with the pediatrician with oral azithromycin with a resolution of cough, lid ecchymoses, and SCH. Pertussis, or “whooping cough,” is an infection of the respiratory tract. It is caused by a Gram-negative coccobacillus, Bordetella pertussis. In the recent years, there has been a resurgence of the disease in the vaccinated individuals as a result of waning of the vaccine-induced immunity., The increase in incidence could be attributed to multiple factors such as heightened awareness, increased public health reporting, and the introduction of PCR testing. Pertussis causes an acute airway infection that is localized and rarely disseminates through the circulatory system. B. pertussis secretes multiple toxins including pertussis toxin, adenylate cyclase toxin, and tracheal toxin. These toxins affect the respiratory cilia and initiate the host immune response, resulting in irritation, and subsequent coughing spells. 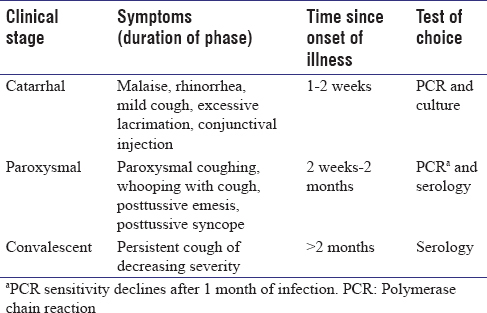 Infection caused by B. pertussis can be divided into three phases: catarrhal, paroxysmal, and convalescent [Table 1]., The first phase is the catarrhal phase. It starts 1–2 weeks after exposure and lasts for 7–14 days. It is indistinguishable from an acute viral upper respiratory tract infection and presents with rhinorrhea, mild cough, malaise, and low-grade fever. The second phase is the paroxysmal phase. It is characterized by paroxysms or a series of coughs during a single expiration, leading to low lung volumes. A paroxysmal cough is followed by vigorous inspiration, which in infants and children with a smaller caliber trachea, is associated by whoop sound which is characteristic of “whooping cough.” Coughing paroxysms are often associated with posttussive emesis and exhaustion. The third phase is the convalescent phase. It occurs after 2–3 months, and in this phase, the severity of the cough gradually declines. The Centers for Disease Control and Prevention has given the definition of a case for pertussis surveillance, and it is defined as a patient with a cough of at least 14 days duration and at least one of the following: A paroxysmal cough, inspiratory whoop, or posttussive vomiting. Confirmation to be done using laboratory test, either culture or PCR assay. The antibiotic regimens effective are azithromycin, clarithromycin, erythromycin, and trimethoprim/sulfamethoxazole. Various complications are associated with the severe paroxysms of coughing such as SCH, lid ecchymosis, syncope, hernias, intracranial hemorrhage, rib fractures, urinary incontinence, and stroke from vertebral artery dissection. This case report emphasizes on the fact that in cases of SCH and lid ecchymosis with a cough, the diagnosis whooping cough should be kept in mind even if the cases are vaccinated. Thus, early detection and prompt treatment can prevent life-threatening complications. Cherry JD. Pertussis in the preantibiotic and prevaccine era, with emphasis on adult pertussis. Clin Infect Dis 1999;28 Suppl 2:S107-11. WHO Pertussis. 2018. Available from: http://www.who.int/immunization/topics/pertussis/en/. [Last cited on 2018 Jul 22]. India Pertussis Cases, 1949-2017. Knoema. 2018 Available from: https://www.knoema.com/atlas/India/topics/Health/Communicable-Diseases/Pertussis-cases. [Last cited on 2018 Jul 22]. Cherry JD. Epidemic pertussis and acellular pertussis vaccine failure in the 21st century. Pediatrics 2015;135:1130-2. Roush SW, Murphy TV, Vaccine-Preventable Disease Table Working Group AT. Historical Comparisons of Morbidity and Mortality for Vaccine-Preventable Diseases in the United States. JAMA. 2007;298:2155-63. Cornia PB, Hersh AL, Lipsky BA, Newman TB, Gonzales R. Does this coughing adolescent or adult patient have pertussis? JAMA 2010;304:890-6. Hewitt M, Canning BJ. Coughing precipitated by Bordetella pertussis infection. Lung 2010;188 Suppl 1:S73-9. Paisley RD, Blaylock J, Hartzell JD. Whooping cough in adults: An update on a reemerging infection. Am J Med 2012;125:141-3.
von König CH, Halperin S, Riffelmann M, Guiso N. Pertussis of adults and infants. Lancet Infect Dis 2002;2:744-50. Hartzell JD, Blaylock JM. Whooping cough in 2014 and beyond: An update and review. Chest 2014;146:205-14. Irwin RS. Introduction to the diagnosis and management of cough: ACCP evidence-based clinical practice guidelines. Chest 2006;129:25S-7.